Eau Claire, Wis. (Blugolds.com) - The University of Wisconsin Eau Claire women's tennis team defeated St. Scholastica 8-1 on Sunday afternoon. 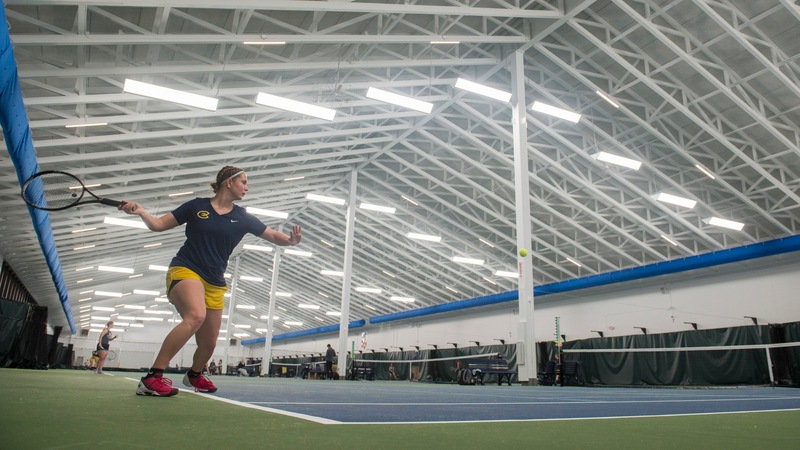 The Blugolds got out to an early 3-0 win, with three victories in doubles play. Natalie Wijesinghe (Apple Valley, MN) and partner Lindsey Henderson (Prior Lake, Minn.) earned a victory at the number one doubles slot, defeating Katelyn Rice/Sara Wennerstrand (CSS) 8-4. Hanna Zevenbergen (Baldwin,Wis./ Baldwin-Woodville) and Molly Stewart (Amery, WI) kept up their winning ways with an 8-2 victory at number two doubles. Alexa Brooks (Beaver Dam, Wis.) and Emma Barnd (Wells, Minn./Unites South Central) paired up and earned a win at the number three doubles slot. In singles action Wijesinghe won convincingly at number one singles, while Stewart kept things rolling at the number two slot. Zevenbergen earned her win at the number four slot, defeating Brynne Hauer (CSS) 6-3, 6-3. Baarnd and Rachel Slonac (Muskego,Wis.) finished the match with victories at the number five and six slots, respectively. The Blugolds' improve to 12-4 overall, and will travel to Grinnell College on April 20th for two matches. UW-Eau Claire will face Grinnell College at 9:00am and Coe College at 12:00pm. Follow the Blugolds on Blugold Game Day or on the 'UWEC Blugolds' app' on your mobile device.